While the exact physiological cause of migraines is not known, there are many medical theories. Some suggest they are neurological, others are thought to be hormonal, and some possibly the result of bone alignment issues. There is also a documented genetic link. There are several different recognized types of migraines, some with aura and some without. Approximately 12-28% of the population experience migraines and 75% of migraineurs are female. 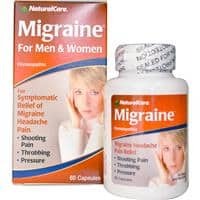 NaturalCare Migraine has been formulated with the highest quality, all-natural homeopathic ingredients. Migraine works by relieving the symptoms of shooting pain and throbbing pressure. A migraine is often more than a severe headache. It can involve pain, nausea, vomiting, and sensitivity to light and sound. It is almost always on one side of the head, although a few types of migraines affect the entire head. The word migraine is French in origin and comes from the Greek hemicrania, as does the Old English term megrim. Hemicrania literally means ‘only half the head’, which describes the majority of migraine pain. Anyone who experiences a migraine can attest to the debilitating symptoms. These include throbbing pain, nausea (90% of sufferers), blurred vision, nasal stuffiness, pallor, scalp tenderness, stiffness in the neck, and sensitivity to light and sound. Unfortunately, those who experience migraines find that these recommended treatments are frequently not effective at treating migraine symptoms. Now there is hope for a reduction in the relief of the throbbing and/or shooting pain, and pressure of migraines. Adults and children 12 years of age and older, take 2 capsules at the earliest sign of migraine symptoms and if needed every 4-6 hours while symptoms persist. For severe conditions, 2 capsules may be taken every 2-4 hours while symptoms persist. Do not exceed 16 capsules per day. If your symptoms continue or worsen, please contact your doctor. For children under 12, consult your health care provider before use. Active Ingredients: Belladonna 6X, 12X; bryonia alba 6X; cimicifuga racemosa 6X; coffea cruda 12X; epiphegus 6X; gelsemium 6X; iris versicolor 6X; melilotus 6X; natrum muriaticum 6X; onosmodium 30X; pulsatilla 9X, 30X; sanguinaria canadensis 6X; scutellaria lateriflora 6X. Other Ingredients: Butterbur, capsule (gelatin, glycerin, and titanium dioxide), feverfew, green tea, 5-hydroxytryptophan, magnesium amino acid chelate, magnesium stearate, pyridoxine HCl (vit. B-6), riboflavin (vit. B-2), and silica. If pain persists, gets worse or if new symptoms occur, consult a doctor to rule out a more serious condition. If you are pregnant or nursing, seek the advice of a health care professional before use. Not intended for use by phenylketonurics or persons with high blood pressure. Do not take with MAO inhibitors. Keep out of reach of children. In case of overdose, get medical help or contact a Poison Control Center right away. Do not use if seals are missing or tampered with.